As the holiday season is a time for merriment and gift-giving, it's also a time to support local artisan wineries and those who make libations in the Beehive a bit more enjoyable. Here are a few tasty suggestions for your holiday shopping list, from cocktail bitters to fruit wines. The craft bitters industry in the United States is booming, and that growth has even found its way to Utah. Roy-based Beehive Bitters Co. makes handcrafted, small-batch cocktail bitters that are a favorite of many of local bartenders. Owner Mike D'Amico's bitters ($13.50 each) are all-natural, with no artificial ingredients. A few drops of Spiced Orange bitters is especially good in whiskey, but can also provide a kick to non-alcoholic drinks and punches. Noting a lack of quality bitters on the local market, husband and wife Jesse Coss and Andrea Latimer created Bitters Lab and now produce five different premium cocktail bitters ($20 each), including my favorites: Charred Cedar & Currant and Habanero Lime. The holiday season is a perfect time for hard cider, which also makes it the ideal time for Salt Lake City-based Mountain West Cider. That's especially true of their 6.9-percent-ABV Cottonwood Dry-Hopped ($5.99) and classic Ruby ($5.99). The latter, combined with a splash of Aperol, makes the yummy Ruby Spritz cocktail. Interested in making your own hard cider? The Beer Nut and Salt City Beer Supply stores carry equipment and ingredients for just that. Layton-based Hive Winery & Brandy Co. produces Stinger Hard Apple Ciders ($6.95-$8.95), including versions infused with raspberries, mint, blackberries, black currants and even one with a raspberry-jalapeño combo. Hive also makes gluten-free, fruit-based wines, meads, melomels, liqueurs and brandy. Their award-winning Christmas Mead (mulled honey wine) is a slam-dunk for the holiday season. The unique and beguiling all-natural wines from Ruth Lewandowski Wines would be an ideal gift for wine drinkers, and complement any holiday table or event. Not quite a red nor a rosé, one of winemaker Evan Lewandowski's most intriguing wines—and versatile enough for a wide range of holiday applications—is his Feints ($18.99), an unusual blend of arneis, dolcetto and barbera grapes with notes of Bing cherries, nutmeg and raspberries. Located in Cedar City but creating products available at wine stores throughout the state, Iron Gate Winery produces wines that would make excellent gifts for winos. I particularly like Iron Gate winemaker Doug McCoombs' Instant Gratification Chardonnay ($14) for its low price and crisp acidity, the latter due in part to a splash of sauvignon blanc that lends tartness to the wine. It's a chardonnay that would pair nicely with a Christmas goose or turkey. Spiced rums seem to be a popular libation for the holidays and as a component of wintry cocktails, so Outlaw Distillery Spiced Rum ($23.99) would make an ideal gift or holiday party staple. 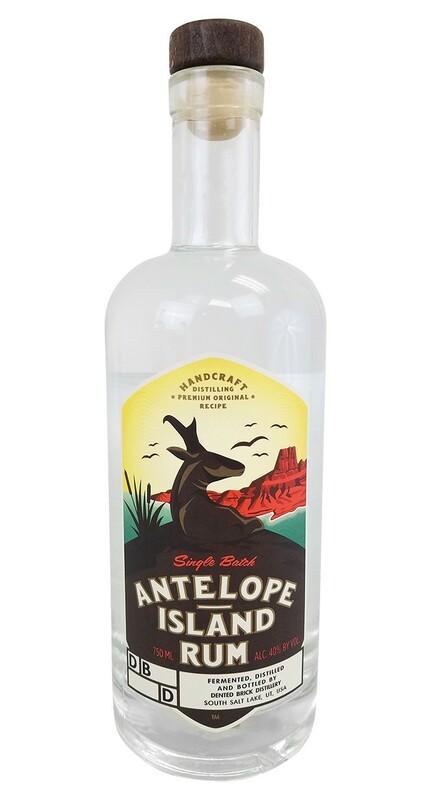 Raw, quality, natural ingredients like pure non-GMO molasses, artesian water, organic sweet sugarcane and aromatic yeasts go into the making of Dented Brick Distillery Antelope Island Rum ($26.95)—the perfect foundation for a holiday hot-buttered-rum cocktail.